Horror has always been seen as a genre primarily for adults. After all, the entire intention of the storytelling style is to creep out and scare its audience, and that doesn’t often have a great effect on children who may not have a firm grasp on separating fiction from reality. However, that doesn’t mean that we haven’t seen some truly amazing horror movies made specifically for all audiences come out over the years, and now seems like the perfect time to celebrate those titles. This weekend will see the theatrical release of Rob Letterman’s Goosebumps - based on R.L. Stine’s wonderful kid-friendly horror book series – and given the movie’s monster mayhem and target demographic, we decided to take a look back at the last few decades and pluck out a selection of 10 great scary movies that kids should love. Read on for our selections! 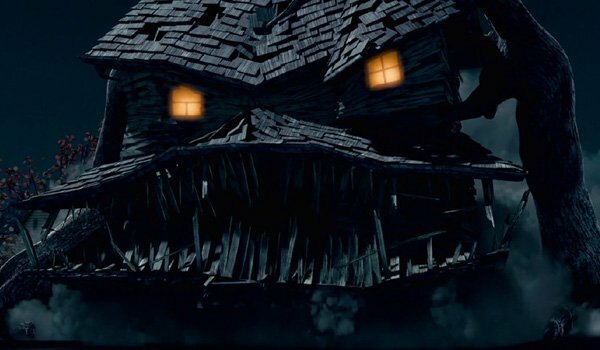 Director Gil Kenan’s Monster House is definitely an off-beat movie. It has a peculiar CGI animation style, an odd ensemble making up its voice cast (including Steve Buscemi, Maggie Gyllenhaal, Kathleen Turner and Jason Lee), and it’s story centers not just on a haunted house, but one that’s actually managed to come to life to eat any and all who pass by. Strange as it is, however, it also works as a creepy, fun 1980s throwback that has a fun approach to monsters and a hefty dose of imagination. It seems silly in this time and place in pop culture to "recommend" Ivan Reitman’s Ghostbusters to anybody – regardless of age group – but it’s my job, so we’re going to roll with it. 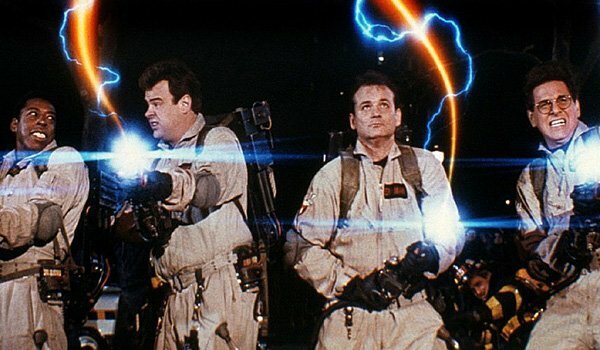 It’s true that the movie is really more ’80s-style PG, in that it still has a bit of bad language and the occasional creepy moment, but this is a film that is meant to be enjoyed by absolutely everyone, and the younger generation needs to know about the heroic acts of Peter Venkman, Egon Spengler, Raymond Stantz, and Winston Zeddmore. 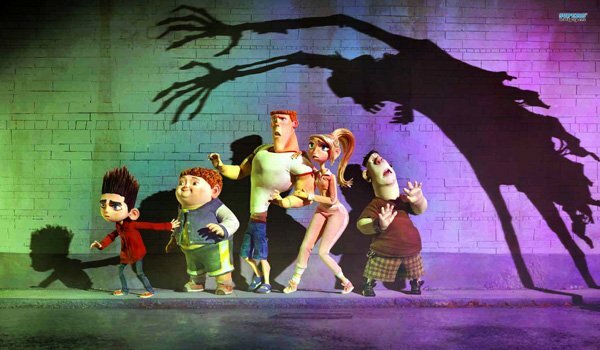 I love Chris Butler and Sam Fell’s ParaNorman so much that I honestly believe that if everyone were to see and appreciate it from a young age that it would create a truly great generation. There are few movies in existence that so elegantly capture what it means to be different and feel persecuted, and wrapped up in a beautifully crafted story of zombies and witches curses is an incredibly important message about acceptance and forgiveness. Do yourself and the world a favor by watching this one with your kids. 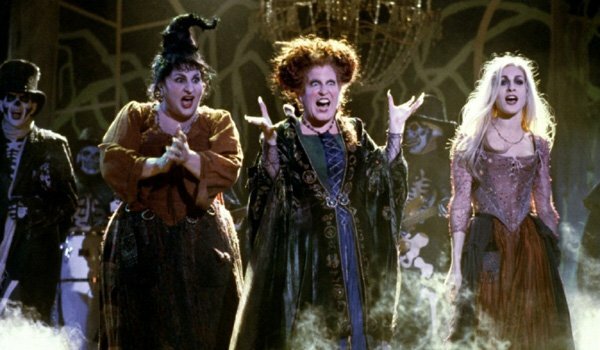 Kenny Ortega’s Hocus Pocus was slammed by critics and was basically a flop when it was released in 1993 – but it has gained a tremendous following in the years since. Millennials who wound up catching this one on home video or on TV now have a key nostalgia pain for it, and with rather good reason: it’s a spooky and weird Halloween story that works on a small enough scale to feel surprisingly timeless. It’s a funny, scary movie that can be enjoyed by the whole family – and it may be worth sharing if not just in preparation for the potential sequel. There are some titles on this list that are absolutely appropriate for kids of all ages, and others that are really more for the little ones who can at least place somewhere on the maturity scale. 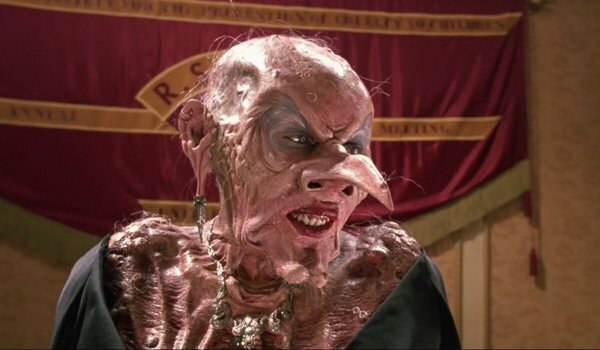 Nicolas Roeg’s The Witches definitely falls in the latter category – but is still very much a film worth rediscovering. As the image above probably reminded you, there is some pretty intense material in the story (it is a Roald Dahl adaptation, after all), but it’s also a fun little good vs. evil adventure perfect for pre-Halloween viewing. There’s something about stop-motion animation that fits shockingly beautiful with kid-friendly horror films, and it’s why we’ve now come to our second example on this list (and it won’t be the last). 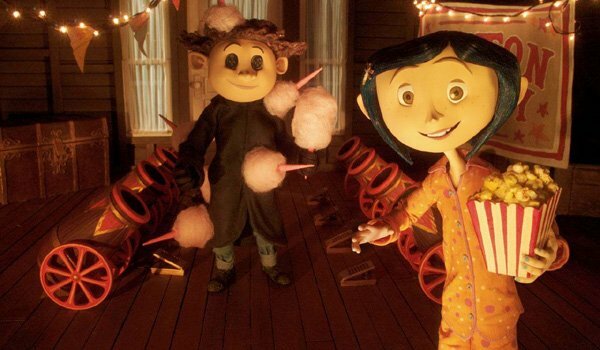 Between its characters with sewn buttons for eyes, and it’s giant, spider-like main villain, Henry Sellick’s Coraline definitely provides a few chills as its unique alternate-world plot unfolds, but it’s also a special little adventure driven by a magnificent heroine and a powerful and important message about family and gratitude . Shane Black is best known for writing buddy cop stories with noir overtones and heavy action, but his work with Fred Dekker on 1987’s Monster Squad is a different flavor featured on his resume. 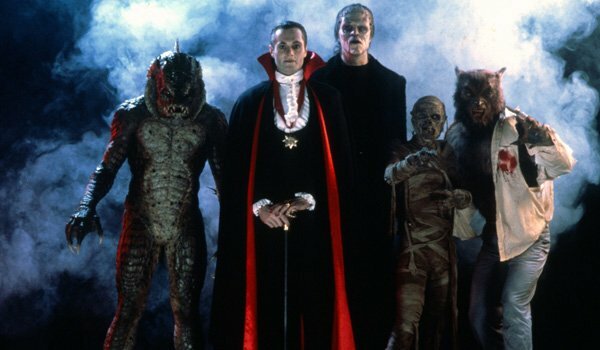 This one has Dracula collecting a bunch of different classic monsters in order to take over the world – and can really only be stopped by a group of rambunctious kids. Fortunately, writing dialogue for young actors has always been one of Black’s greatest skills, and this movie remains a fun bit of ‘80s nostalgia that surely the younger generations will be able to appreciate as well. The legacy of "Wolfman’s got nards" needs to live on. 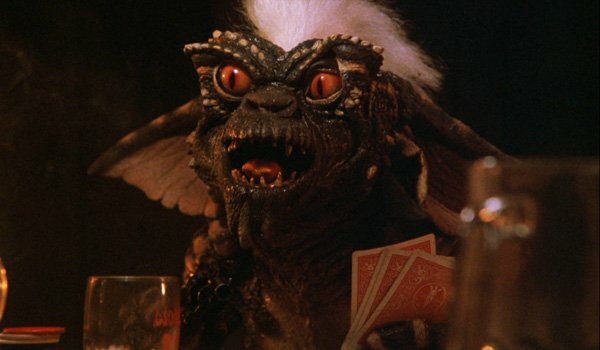 Joe Dante’s Gremlins seems like another movie that is just a tad silly to recommend, as any person who grew up in the 1980s or 1990s is going to have a healthy appreciation of the movie that makes them want to pass it on to the youngins of today. The tale of Billy Peltzer and the three rules of handling Mogwai will be a part of our pop culture forever, and it’s largely because it’s one of the best kid-friendly monster movies ever made. 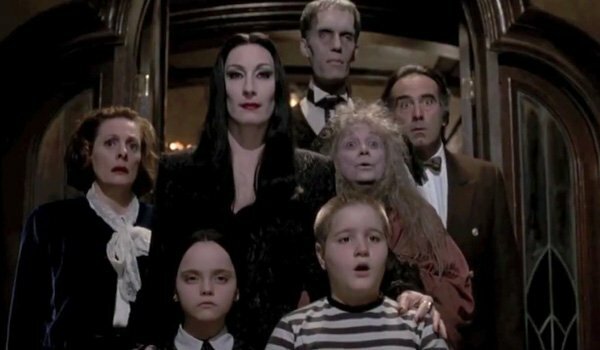 Cards on the table: I was four years old when I got to see Barry Sonnenfeld’s The Addams Family in theaters, and I cried to the extent that my parents had to take me out of the theater (young Eric was a bit creeped out by Thing). But while four years old may to too young for this one, it still remains a dark little treat that never goes too far over the line with its horror elements. Its goofiness will make kids laugh, while the film also gives them a healthy appreciation of gallows humor. Sick of stop-motion animated films yet? Good, because we’ve saved the truly classic one for last. 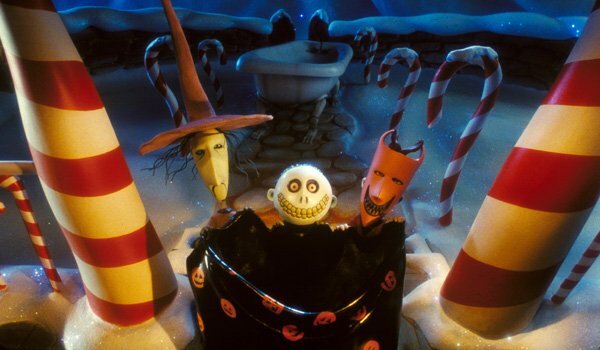 Henry Selick’s The Nightmare Before Christmas is a dual-holiday treat that will stick around for generation after generation, if not because of the wonderful soundtrack, than because of the beautiful and amazing cast of characters – from the heroically misguided Jack Skellington, to the lovable Zero, to the villainous Oogie Boogie. I’d recommend watching this one the night of Halloween, as it’s a rather perfect one to lead into the weeks/months of Christmas countdown.